I put my injen on a little while ago and the directions state that you have to remove bumper, and side fender, and the process takes and hour or whatever it is. Well when I put mine on me and my uncle didn't take off the bumper nor did we take off the side fender. We took out the inner fender well cover, unbolted the stock air box, also obviously we took the tire off while we did this, lol forgot to mention that... but any who, we then took off the sensor and what not, turned the air box towards the axle, or the rotor, and pulled it out that way. We then slid the Injen tubing right in, putting everything back together, left all the bolts lose to make final adjustments, then tightened it and wahlah all finished, no check engine light nothing, went together easy and simple, and I swear it only took us about 20 to 30 minutes to do it, and I love the Injen sounds good, and seemed like to me that it gave off a pretty good performance gain. G/L. Just figured I'd give my little adventure. I would recommend searching in the 2.2 Performance section. I'm pretty sure they have a thread like this describing what L61 (Your engine) intakes are available. any pros or cons to the JBP intake with an AEM dry flow? oiled filter makes more power than a dry flow? any dyno proof on this or did i miss this discussion already? Location: Shaw AFB, Sumter, SC. Just installed my fujita yesterday. It was a bit of a pita to get it to fit properly but im pretty sure I got it on good and no intake on car action anywhere. If there was no overflow tank the brackets for connecting the tubes would of been a HELL of a lot easier. But in the end it was worth it. It sounds great of course and felt a little bit more power. Throttle response is a little better too. Couple questions though. How would I know if say the filter came off?? I know its on tight enough but would the sound be a little different if it fell off? Also, I know fujita has rubbing issues and that someone posted a fix on it. Mines not rubbing now but if it does in the future I want to be prepared, thanks. NO CEL EITHER. Just ordered my Injen CAI just now. Looking forward to putting that bad boy on my car as soon as it comes in. This is my first attempt at posting pics...so please bear with me. If this doesn't work, just search for my pics in the gallery. I installed the K&N Typhoon intake system. The first thing I noticed was increased snap from the line and more power downrange. It is certainly louder and has a characteristic whine, but I'm certainly happy with the results. The install is fairly easy and the instructions from K&N are right on...with one exception. You must connect the boot to the throttle body BEFORE connecting it to the tube. Much less hassle on the install this way. 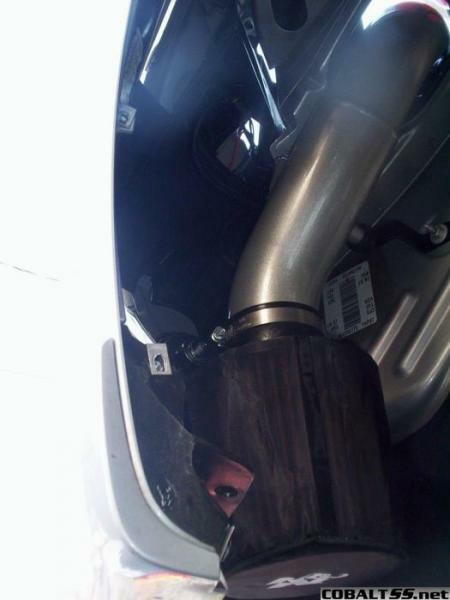 Here's two pics...one of the tube in the engine compartment, and one of the filter in the wheel well. I've put almost 1000 miles since the install...and no CEL. The only things I can think of that would be causing them would be either air leaks at your connections, or clogging of the filters...both of which would create the changes necessary to force the CEL in the system. also guys.. for the AEM what is the right number for the Whole intake and not just the little 4" pipe which i got the other day...? 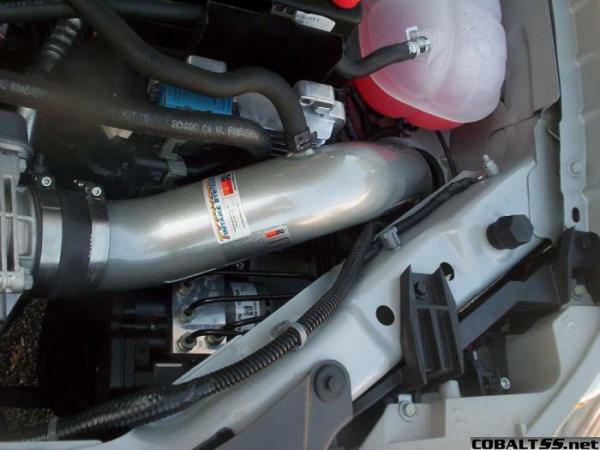 and which is the full intake in 3"
Its a 2007, u think its the tuning thats letting it go that fast or what? Last edited by Better Maxim; 10-06-2007 at 03:31 PM. Do you suppose (by looking at image #2) that if you were to cut the end of the tubing that it would be on the correct angle to couple to the OEM Airbox. Is there anyone with a K & N that could make the comparison. I contacted K&N to see how much the intake tube would cost. Any check engine lights so far? I have had one on ever since I put my cold air intake on about 5,000 miles ago. did you get the updated flash for your computer? updated flash?? i have no clue, never knew of a thing. and if stage 2 fixes it then im good cause i just ordered my stage 2 today in fact. got it off of ebay brand new for $435 shipped!!! it should be in in about 3 days or so and then im gunna go have it installed. 2.0 LSJ ONLY: What intake do you have? 2.0 LSJ ONLY: What aftermarket intake do you have? Please vote..... did I get them all? Last edited by JonyyB; 11-24-2007 at 12:56 PM. whoa, first voter. k&n here. and if i'm not mistaken there is no gmpp intake for the 2.0, only the 2.2 and 2.4.